"I put most of myself into that opus," Edith Wharton said of The Reef, possibly her most autobiographical novel. Published in 1912, it was, Bernard Berenson told Henry Adams, "better than any previous work excepting Ethan Frome." 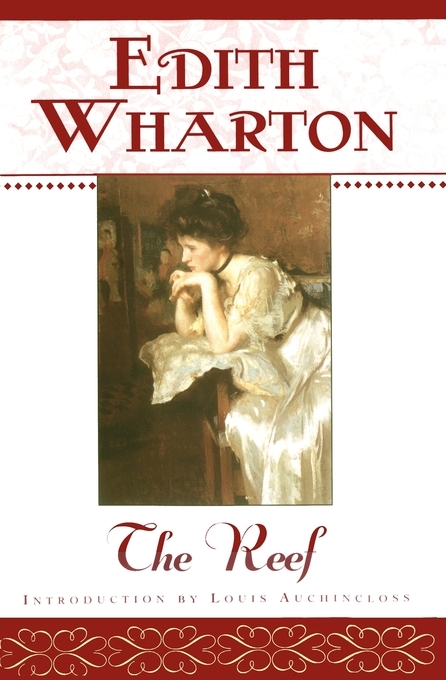 For its dramatic construction and acute insight into social mores and the multifaceted problem of sexuality, The Reef stands as one of Edith Wharton's most daring works of fiction. She had put him off at the very last moment, and for the second time: put him off with all her sweet reasonableness, and for one of her usual "good" reasons -- he was certain that this reason, like the other (the visit of her husband's uncle's widow), would be "good"! But it was that very certainty which chilled him. The fact of her dealing so reasonably with their case shed an ironic light on the idea that there had been any exceptional warmth in the greeting she had given him after their twelve years apart. They had found each other again, in London, some three months previously, at a dinner at the American Embassy, and when she had caught sight of him her smile had been like a red rose pinned on her widow's mourning. He still felt the throb of surprise with which, among the stereotyped faces of the season's diners, he had come upon her unexpected face, with the dark hair banded above grave eyes; eyes in which he had recognized every little curve and shadow as he would have recognized, after half a life-time, the details of a room he had played in as a child. And as, in the plumed starred crowd, she had stood out for him, slender, secluded and different, so he had felt, the instant their glances met, that he as sharply detached himself for her. All that and more her smile had said; had said not merely "I remember," but "I remember just what you remember"; almost, indeed, as though her memory had aided his, her glance flung back on their recaptured moment its morning brightness. Certainly, when their distracted Ambassadress -- with the cry: "Oh, you know Mrs. Leath? That's perfect, for General Farnham has failed me"-had waved them together for the march to the dining-room, Darrow had felt a slight pressure of the arm on his, a pressure faintly but unmistakably emphasizing the exclamation: "Isn't it wonderful? -- In London -- in the season -- in a mob?" While he pushed on in the wake of his luggage his thoughts slipped back into the old groove. He had once or twice run across the man whom Anna Summers had preferred to him, and since he had met her again he had been exercising his imagination on the picture of what her married life must have been. Her husband had struck him as a characteristic specimen of the kind of American as to whom one is not quite clear whether he lives in Europe in order to cultivate an art, or cultivates an art as a pretext for living in Europe. Mr. Leath's art was water-colour painting, but he practised it furtively, almost clandestinely, with the disdain of a man of the world for anything bordering on the professional, while he devoted himself more openly, and with religious seriousness, to the collection of enamelled snuff-boxes. He was blond and well-dressed, with the physical distinction that comes from having a straight figure, a thin nose, and the habit of looking slightly disgusted -- as who should not, in a world where authentic snuff-boxes were growing daily harder to find, and the market was flooded with flagrant forgeries? Darrow, for his part, was content to wait if she wished it. He remembered that once, in America, when she was a girl, and he had gone to stay with her family in the country, she had been out when he arrived, and her mother had told him to look for her in the garden. She was not in the garden, but beyond it he had seen her approaching down a long shady path. Without hastening her step she had smiled and signed to him to wait; and charmed by the lights and shadows that played upon her as she moved, and by the pleasure of watching her slow advance toward him, he had obeyed her and stood still. And so she seemed now to be walking to him down the years, the light and shade of old memories and new hopes playing variously on her, and each step giving him the vision of a different grace. She did not waver or turn aside; he knew she would come straight to where he stood; but something in her eyes said "Wait," and again he obeyed and waited. The Marquise de Chantelle, as Darrow soon perceived, had the same mild formidableness as the late Mr. Leath: a sort of insistent self-effacement before which every one about her gave way. It was perhaps the shadow of this lady's presence-pervasive even during her actual brief eclipses -- that subdued and silenced Mrs. Leath. The latter was, moreover, preoccupied about her step-son, who, soon after receiving his degree at Harvard, had been rescued from a stormy love-affair, and finally, after some months of troubled drifting, had yielded to his step-mother's counsel and gone up to Oxford for a year of supplementary study. Thither Mrs. Leath went once or twice to visit him, and her remaining days were packed with family obligations: getting, as she phrased it, "frocks and governesses'' for her little girl, who had been left in France, and having to devote the remaining hours to long shopping expeditions with her mother-in-law. Nevertheless, during her brief escapes from duty, Darrow had had time to feel her safe in the custody of his devotion, set apart for some inevitable hour; and the last evening, at the theatre, between the overshadowing Marquise and the unsuspicious Owen, they had had an almost decisive exchange of words. Now, in the rattle of the wind about his ears, Darrow continued to hear the mocking echo of her message: "Unexpected obstacle." In such an existence as Mrs. Leath's, at once so ordered and so exposed, he knew how small a complication might assume the magnitude of an "obstacle"; yet, even allowing as impartially as his state of mind permitted for the fact that, with her mother-in-law always, and her stepson intermittently, under her roof, her lot involved a hundred small accommodations generally foreign to the freedom of widowhood -- even so, he could not but think that the very ingenuity bred of such conditions might have helped her to find a way out of them. No, her "reason," whatever it was, could, in this case, be nothing but a pretext; unless he leaned to the less flattering alternative that any reason seemed good enough for postponing him! Certainly, if her welcome had meant what he imagined, she could not, for the second time within a few weeks, have submitted so tamely to the disarrangement of their plans; a disarrangement which his official duties considered -- might, for all she knew, result in his not being able to go to her for months. "Please don't come till thirtieth." The thirtieth -- and it was now the fifteenth! She flung back the fortnight on his hands as if he had been an idler indifferent to dates, instead of an active young diplomatist who, to respond to her call, had had to hew his way through a very jungle of engagements! "Please don't come till thirtieth." That was all. Not the shadow of an excuse or a regret; not even the perfunctory "have written" with which it is usual to soften such blows. She didn't want him, and had taken the shortest way to tell him so. Even in his first moment of exasperation it struck him as characteristic that she should not have padded her postponement with a fib. Certainly her moral angles were not draped! He had rashly vowed, when the telegram was flung into his window: "At any rate I won't turn back" -- as though it might cause the sender a malicious joy to have him retrace his steps rather than keep on to Paris! Now he perceived the absurdity of the vow, and thanked his stars that he need not plunge, to no purpose, into the fury of waves outside the harbour. With this thought in his mind he turned back to look for his porter; but the contiguity of dripping umbrellas made signalling impossible and, perceiving that he had lost sight of the man, he scrambled up again to the platform. As he reached it, a descending umbrella caught him in the collarbone; and the next moment, bent sideways by the wind, it turned inside out and soared up, kite-wise, at the end of a helpless female arm. Its possessor had dropped her bag and bundles to clutch at the tattered umbrella. "I bought it only yesterday at the Stores; and -- yes -- it's utterly done for!" she lamented. "Not for two hours? How lucky -- then I can find my trunk!" It pleased him that she did not return the conventional "Oh, would you?" Instead, she corrected him with a laugh -- "Not a trunk, but my trunk; I've no other -- " and then added briskly: "You'd better first see to getting your own things on the boat." "Well... perhaps not by this boat." Again he felt a stealing indecision. "I may probably have to go back to London. I'm-I'm waiting...expecting a letter..." ("She'll think me a defaulter," he reflected.) "But meanwhile there's plenty of time to find your trunk."